The Force Awakens returned many of our favorite characters from the Original Trilogy back to the screen, but not without the obvious changes to their outward appearances as evidence of the thirty some years since Return of the Jedi. For those characters who would not necessarily age, at least if properly maintained, and of course, this refers to R2-D2 and C-3PO, something had to be done to show that they, too, had experienced things in the interim. For Artoo, the familiar blue and white astromech went into a deep depressive funk or the droid equivalent, after Luke Skywalker abandoned him to disappear into the galaxy’s stars. Meanwhile, for C-3PO, we were almost instantly made aware that one golden arm had been replaced with a red one. It was a visual cue that even received a line of dialogue between C-3PO and BB-8, with the protocol droid commenting that he probably should replace the arm. Nothing more is said about the arm and the film continues onward until one of the very final scenes in The Force Awakening. Rey has the location of Luke and is setting off in the Millennium Falcon with Chewbacca and R2-D2 to find him. Somewhat similar to the end of The Wizard of Oz, everyone at the base comes out to see her off, including C-3PO. In one of the several ‘blink and you miss it’ moments, C-3PO’s red arm is gone and his golden arm returned. The mystery of that red arm was only just now answered with the release of the special one off issue Star Wars Special: C-3PO. Originally scheduled for release the week following The Force Awakens’ debut, it bafflingly became one of the longest remaining minimal secrets of the film. Allegedly, the delay occurred because everything related to The Force Awakens required J.J. Abrams’ approval and that approval was delayed for the comic, but even then, after a push back to February, then to March, and finally mid-April, it’s still an odd thing. Neither here nor there, the result is a one shot which while endearing at times, is undermined by its length and how it’s handled in the actual film. Cheekily entitled, “C-3PO: The Phantom Limb,” it begins with a Resistance ship crash landing on a planet with an exceedingly hostile environment. The only survivors are C-3PO, quickly introduced as the Droid Communication Chief for the Resistance, and five other droids. One is a security droid named PZ-99, a class of droids introduced in The Force Awakens and seen in several background scenes in movie, as well at the beginning of the Princess Leia adventure, Moving Target. Then there’s a medical droid, 2Med2, a construction droid, Construction Droid, another security droid, VE-44, and finally, a captured First Order protocol droid, OMR1. Invaluable for possessing the location of a captured Admiral Ackbar, the black droid must be taken back to General Leia. Throughout the story, OMR1 serves as something of a questioning conscience for everyone who has every pondered droid free will and determination. It boils down to how much of a droid is inherent to the droid and how much is it programmed, condemned to exist in whatever role its human/alien owners deign. The only hope for rescue lies in a First Order ship wrecked elsewhere on the planet with a beacon that can be used to summon the Resistance. Between the droids and the ship are a number of barriers, such as giant spice spiders, omnivorous water creatures, and even burning acid rain. Across each barrier, one droid after another executes its programmed behavior, which ultimately results in that droid’s death. The first is PZ-99, sacrificing himself to allow the other droids to escape the spiders. Next up is 2Med2, the first unfortunate victim of what appear to be sharks crossed with octopuses (there was a SyFy movie on these). Construction Droid lays himself out as a bridge to get around them, but suffers too much damage to save himself from disappearing into the predator filled waters. In the same violent crossing, one of the tentacle creatures rips off C-3PO’s arms. The droids had barely escaped this peril when giant mutant dragonfly-like creatures zip in and away with VE-44, leaving just the protocol droids. This pairing allows for a continued examination by OMR1 on the topic of memory swipes, which both he and C-3PO had suffered. C-3PO famously groaned at the end of Revenge of the Sith when Bail Organa ordered his memory swiped (to allow for C-3PO in the Original Trilogy not to recall that Darth Vader was Anakin Skywalker – this doesn’t excuse R2-D2’s knowledge, however). The discussion brings up the new fact that memory swipes are never 100% complete and the droids essentially dream of their past memories, with C-3PO recalling Naboo and Coruscant without truly knowing their identities. The pair are assaulted by the final challenge, a ruinous acid rain, and they only just make the shelter of a broken TIE fighter wing to avoid being destroyed. For much of the comic, the theme of programming has been batted back and forth between OMR1 and C-3PO, one the cynic and the other dreamer. When a droid sacrifices itself, C-3PO wants to believe it did so in a heroic gesture, while OMR1 more darkly points out that it simply was doing what it was programmed to do. This point arises to a climax at the end of the story, as the droids must find a way to retrieve the homing beacon before it, too, is destroyed by the rain. In a surprise twist, OMR1 gives C-3PO the location of Ackbar, a piece of knowledge he had previously claimed not to possess. 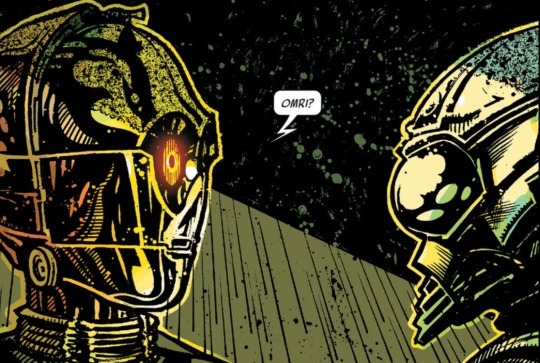 When C-3PO questions him about his loyalties and programming to the First Order, OMR1 explains to the golden protocol droid that he was making the decision out of friendship, beyond whatever his programming called for. 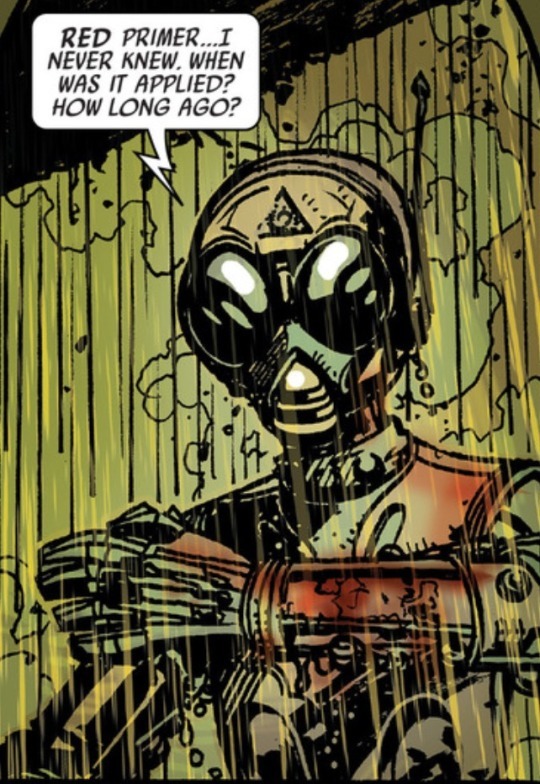 At this point, the black droid steps out into the burning acidic rain and retrieves the beacon, in the process the acid revealing a former red finish that had been forgotten with his previous memories. OMR1 sacrifices himself, outside of his programming, to save C-3PO. Eventually, Poe Dameron and BB-8 arrive to save the protocol droid, who they find cradling the red arm of OMR1. Later, BB-8 finds C-3PO gazing quietly out a window aboard a space ship and inquires as to how the droid is doing. C-3PO admits to having been quiet of late and tells BB-8 he intends to keep the arm, regardless of how it offends his aesthetic sensibilities, as a reminder. The panel reveals it’s a reminder of the sacrifices of the droids. And in this way, for some at least, there must have been a little bit of an emotional gut punch with how this story was resolved in The Force Awakens. Rather, it was summarily dismissed with the equivalence of “Okay, C-3PO is all good now – let’s return him to his usual appearance.” This handling of C-3PO’s backstory cheapens it, and not to mention, makes BB-8 appear a little annoying, repeatedly bugging C-3PO about his arm. For the entirety of C-3PO’s appearance in the Original Trilogy, he sported a silver shin leg piece. This later set him apart from the C-3PO of the Prequel Trilogy who had not yet experienced an event necessitating a replacement. It’s unfortunate that the droid could not carry the red arm over as his signature Sequel Trilogy appearance. At the best, we must consider that C-3PO had emotionally healed, as much as a droid might, and so no longer needed the memento of his experience on that planet and the sacrifices made. 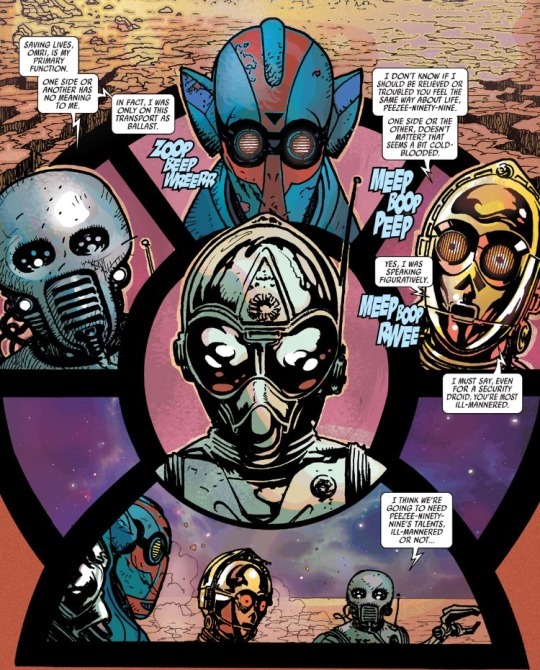 Nonetheless, this little decision undermines the idea that C-3PO had grown as a character, essentially, at least visually, setting him back a bit – awkwardly calling backwards to the comic’s very important theme concerning memory swipes. The character, like a droid, was not allowed to hold on to those things which make them who they are. 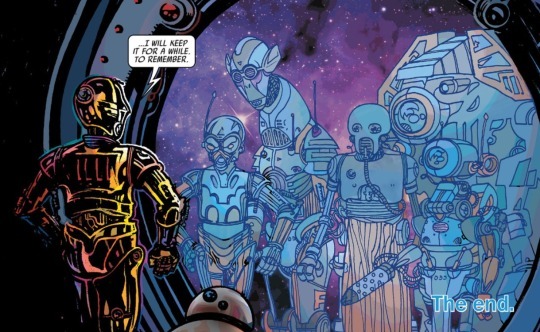 In terms of droids in general, C-3PO: The Phantom Limb builds upon, or would have served as a foundation for, a growing exploration of droids in the Star Wars universe and their existence: machines or something more? Recently, this was the subject of Rebels’ episode, “The Forgotten Droid,” which had an Imperial droid very similar in appearance to OMR1 (different functions, however) who made the decision to help the astromech Chopper out of friendship, too. It’s unlikely we will see significant changes to the Star Wars universe to change the plight of droids, but these stories remain entertaining and enjoyable to read and ponder. 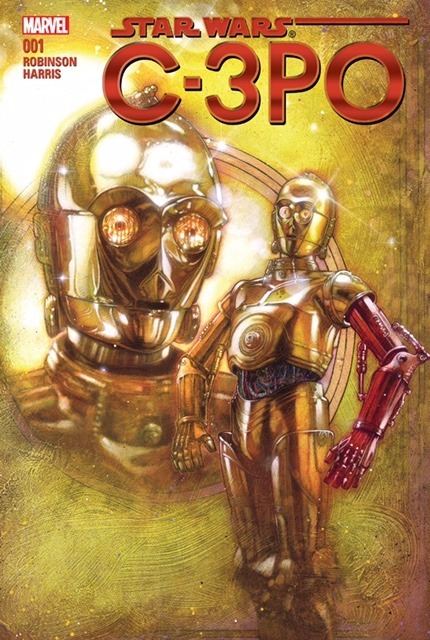 Star Wars Special: C-3PO, written by James Robinson with art by Tony Harris is a short, but enjoyable excursion into C-3PO’s past. If allowed more pages and more time to develop the all too expendable droids, it would have been a much better comic, but that’s not to say it isn’t a good one. The art is a bit stylistic with many colors with overall tones shifting as the story progresses. It’s a style that grows with repeated admiration. The most unfortunate aspect of C-3PO’s story isn’t the length, however, but simply how oddly enough the focus of the story is reflected in reality as seen in The Force Awakens. It’s too bad the comic couldn’t have informed the film.